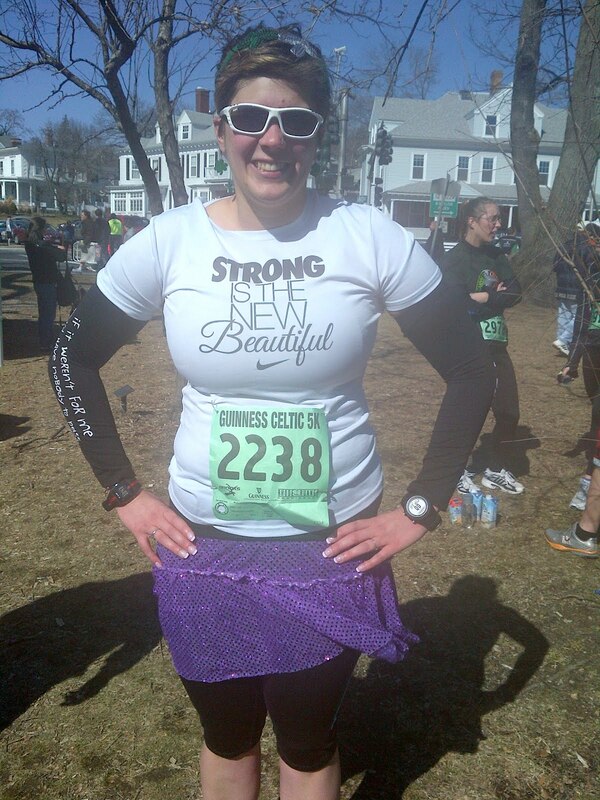 DoubleD Athlete: Celtic 5k- new PR! Okay so it is starting to seem like every race I run lately is yielding a new PR. I guess that means my training is working, I am getting faster, and I am starting to believe I still haven't found my run pace. I am happy to see my winter training- known to some as "off-season"- is paying off and should be pretty awesome to see the payoffs this season! So anyway back to the race. D and I did this race last year- mainly because it is maybe half a mile from my house. It seems silly not to sign up for a race we can jog to the start line. The Irish Cultural Center plays a big part in this race and a few other races in the city and they seem to do a GREAT job with their races. This one is big. It takes place the morning of the Worcester St. Patty's Parade. Let me tell you if you haven't been to the Worcester Parade it is second to Southie- HUGE! So the streets are already closed down and the city is ready for it so it is a pretty well oiled machine. We ran down to the start line running into a friend of ours on the way. The weather was perfect- the mild winter continues. I used the race course as my Lactic Acid run test a few weeks ago and ran a 26 min 5k so I was pretty psyched to see what this race would bring. My coach didn't taper me down for this so I swam and biked Friday and Saturday then raced Sunday. I knew I wasn't going to have a well rested body to have the BEST possible time. I had my previous PR on my hand and my course time for the year before- I had some goals set in my mind. Of course- my coach had on my training plan 5k- take it easy (OOOPS!). The run down to the start helped loosen up my legs and when we headed off I felt pretty good. I set my watch to stick around a 8:50pace- I hadn't done the math but I knew if I stayed under 9 I would be good to take off my time from the year before. The course is pretty flat and fast. I rolled my ankle around mile 2 but lucky for me I think my ankles are double jointed so I had no issue. I crossed the finish at 27:32 according to my watch which was a 1 second PR. The official results came out 27:29- so that is a new PR by 4 seconds and a course PR by 29 seconds. It wasn't the 26 something I was hoping for but I'll take it given I wasn't rested and tapered. We did pop down to the parade after we took a shower so D could witness the insanity. It was a good day. The race also entitles you to free admission at all the parade course bars and free drinks but we decided to skip that. All in all a decent race day. And another PR in my TEAM SPARKLE SKIRT- the purple just keeps bringin the good luck!